It’s Day 7, and our last full day on the Faroe Islands. Up till now we’d been fairly lucky with the unpredictable North Atlantic weather, with most days bright and sunny and only the occasional shower during our week-long visit. Well, Mother Nature saved the rain for the end – lots and lots of rain. 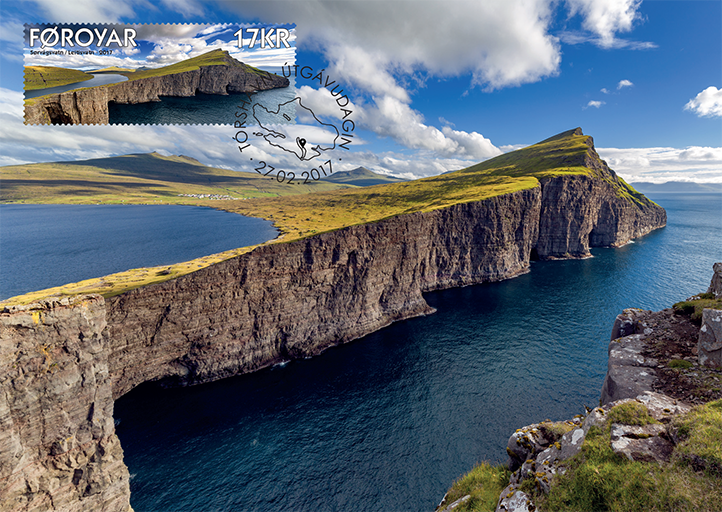 And this was the day we had hoped to see two of the most iconic views of the Faroes – the Mulafossur waterfall at Gásadalur village, and the Sørvágsvatn “floating” lake, both located on Vágar island. 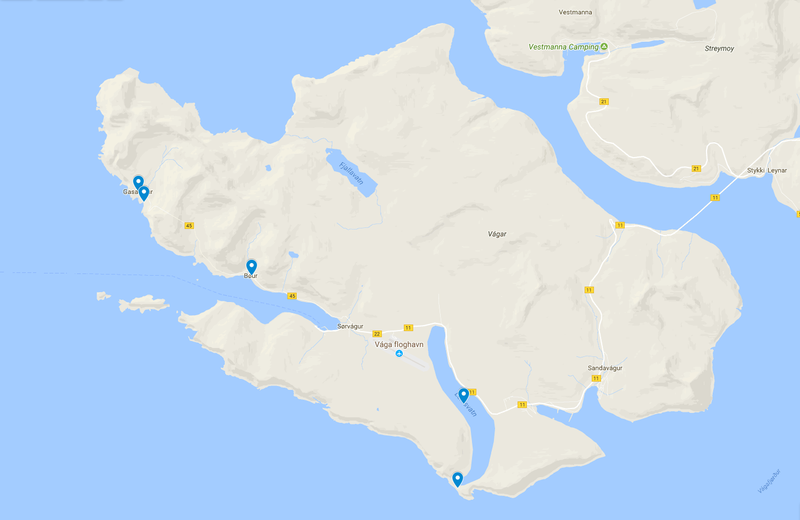 Exploring south Vágar: Gásadalur and Sørvágsvatn. 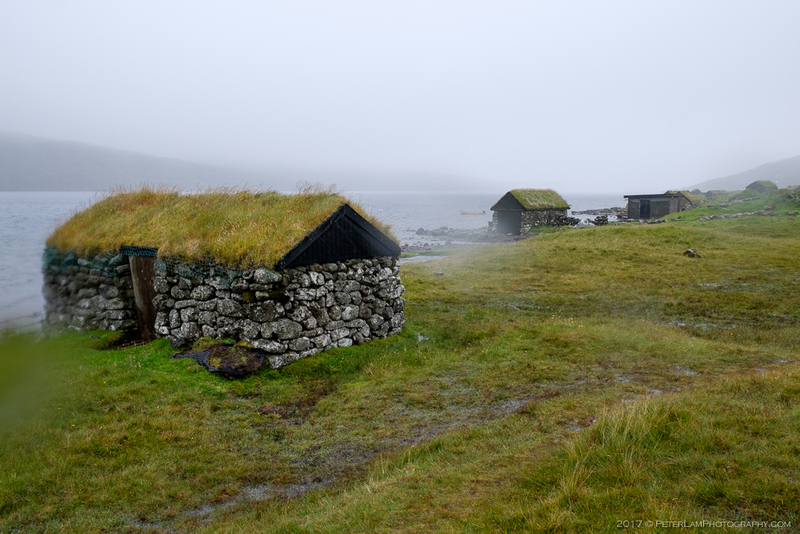 “Goose Valley” has always been one of the most isolated villages on the Faroes. Located on the west side of Vágar near the edge of a cliff, Gásadalur is surrounded by the highest mountains on the island and has no natural harbour. 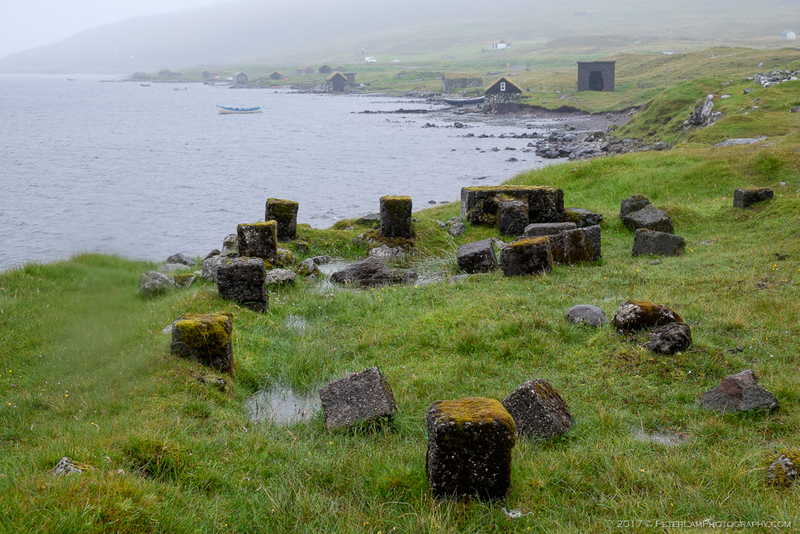 In 2004 a tunnel and road finally connected the village to the rest of the country; prior to that, the only way to the settlement was on foot from Bøur village on the north shore of Sørvágsfjørður fjord. Our original plan was to hike this 3.5-km postal route to Gásadalur. 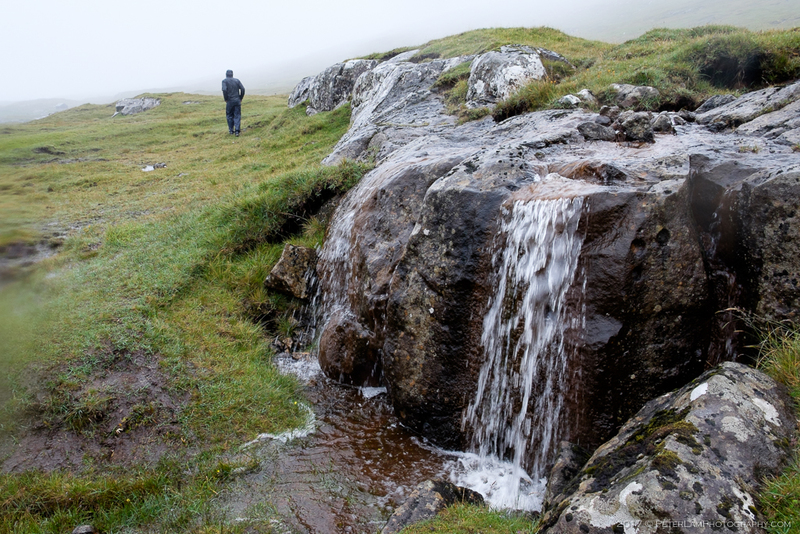 On the best of days, this is a challenging and tricky hike, tracing the seaside edge of Gásadalsbrekkan mountain – in bad weather, by all accounts, it is downright suicidal. One slip on the wet rocks would surely mean serious injury, or worse. To think that back in the day, the local postman walked this route 3 times a week (rain or shine) is truly impressive. Given the weather conditions, we opted the safety of the car and road tunnel, hoping for some miraculous sunny break but were instead met with heavier rain and strong winds by the time we arrived at the village. 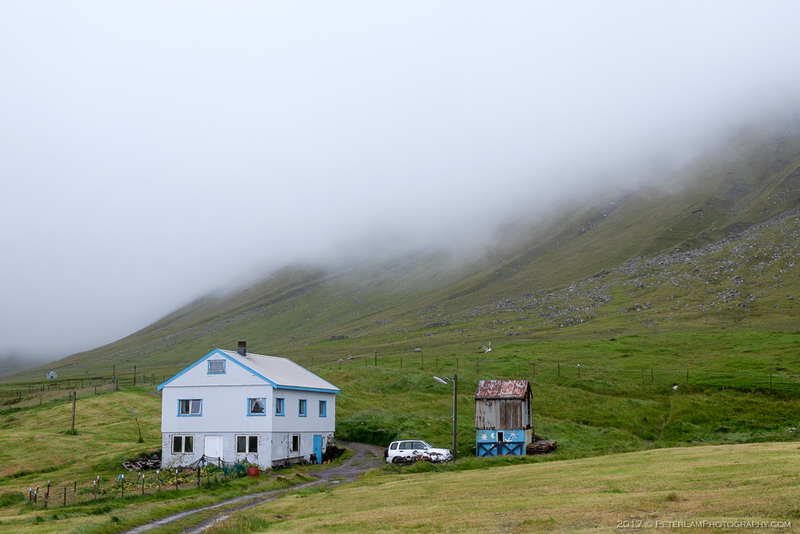 The village was barely visible under the low clouds, and surrounding mountain peaks completely obscured. Taking a gravel path to a viewpoint (precariously close to a vertical cliff), we took a few quick photos before deciding to seek shelter and move on to our next destination. One of the few inhabited houses at Gásadalur. 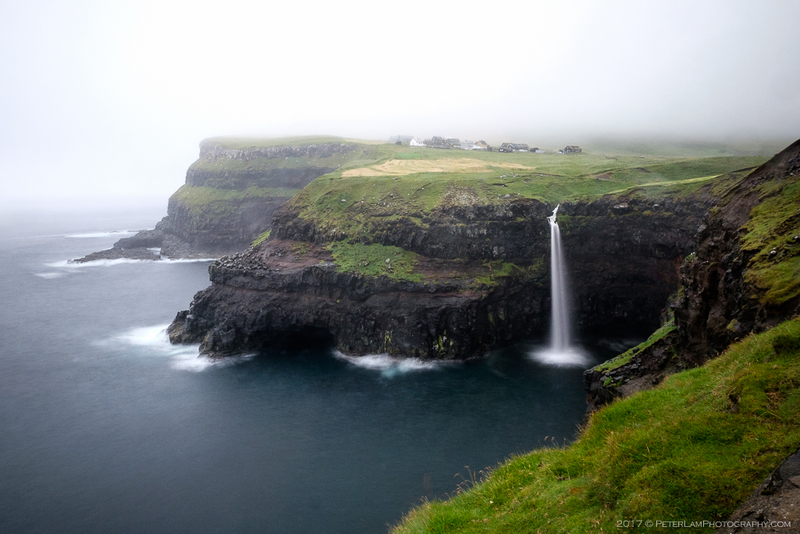 The famous view of Gásadalur village and Mulafossur waterfall in less than ideal conditions. Located on the south side of Vágar, Sørvágsvatn is the largest lake of the Faroe Islands. The south side of the lake empties into the Atlantic via the Bøsdalafossur waterfall. Covering 3.4 square kilometers adjacent to the ocean, it is also 30 meters above sea level, appearing from some view angles to magically float above the water. This optical illusion can be seen from the far end of the hiking trail that traces the length of the lake. By the time we arrived at the trailhead, everyone in the party – except Jeff – had pretty much concluded that the hike, though an easy 6km, was not worth the effort in the inclement weather conditions. In fact, the rain and wind had picked up since our first stop at Gásadalur, and visibility was steadily getting worse. Jeff was adamant in completing the trek, and since it is never a good idea to hike alone – especially in unfamiliar territory – I volunteered to go with him while the rest of the group warmed up in a nearby cafe. 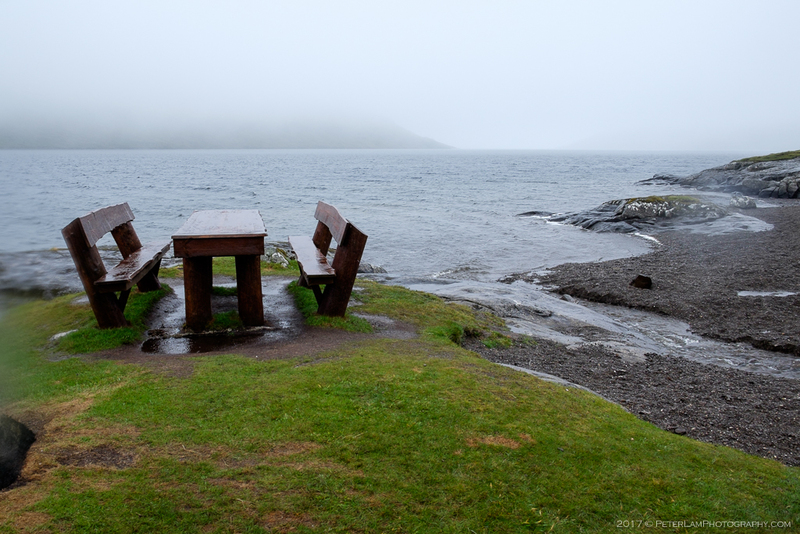 It may have been a bad idea, but I saw his point – this was our last day on the Faroes, and when would we have a chance to visit again? Besides, what if it somehow cleared up? I regretted my decision almost immediately. A couple of minutes into the hike and we were both soaked and shivering, despite sporting full so-called “waterproof” rain gear. 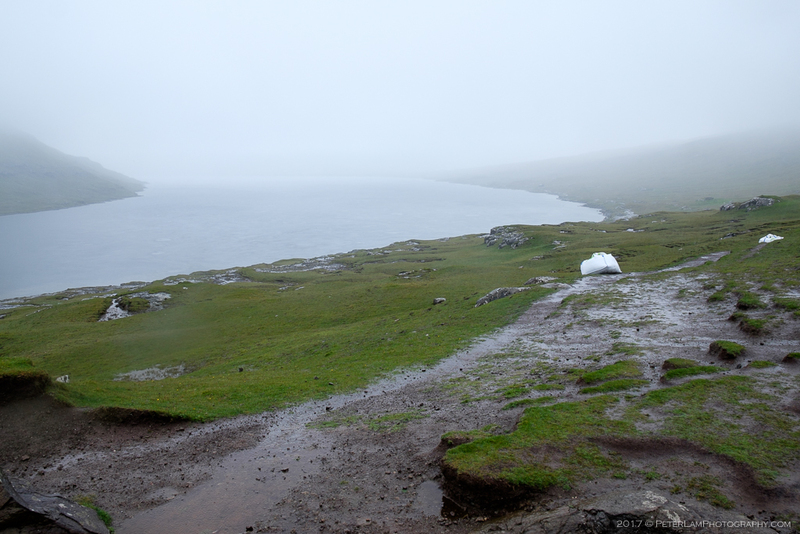 We made our way along the lake, navigating over fast streams of rainwater gushing down the hillside. Towards the end of the lake we ascended the hill looking for the famous viewpoint, hoping for that one photo that would justify the wet and cold misery. We saw nothing. Low clouds enveloped the peak, and the strong winds made it a short stay at the peak. Heading back down, visibility was so bad we even had problems locating the lake! 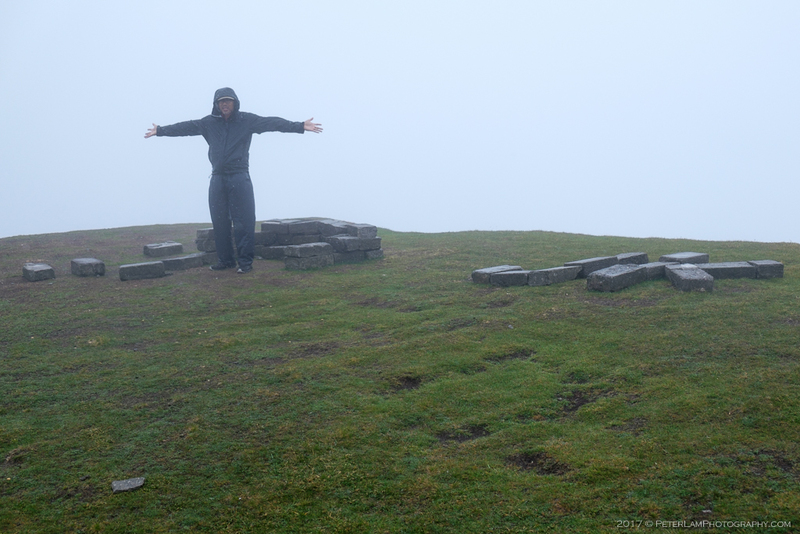 Three hours after setting out, we were back at our starting point, broken and defeated by the rain. 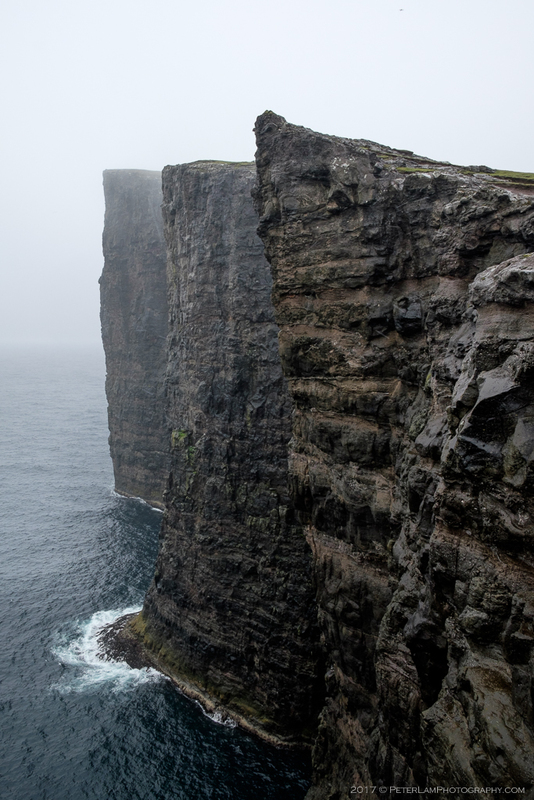 Our last hike on the Faroe Islands was certainly a memorable one. In retrospect, perhaps it was meant to be – something to look forward to, a second attempt, on a return visit to this wonderful country. One day! All wet and not much of a view at all. 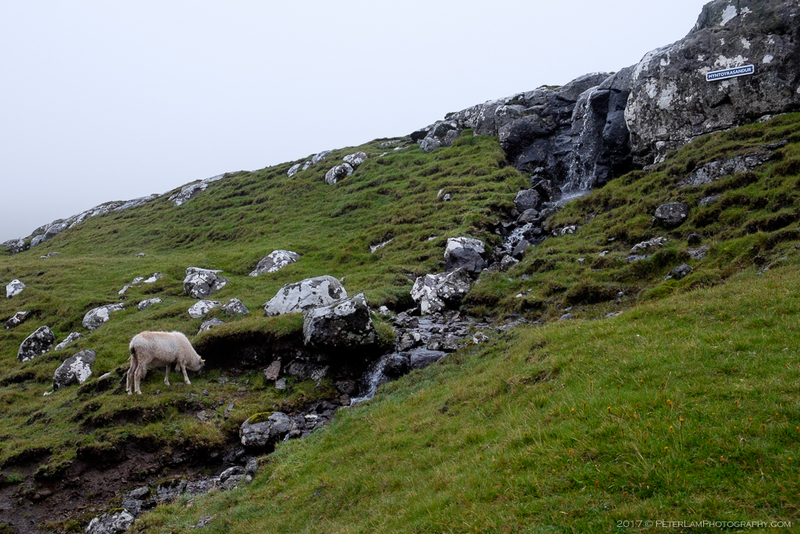 We were not much better off than the sheep we met on the trail. Rain turned small streams into gushing waterfalls. Picnic and rest area on the lake shore. 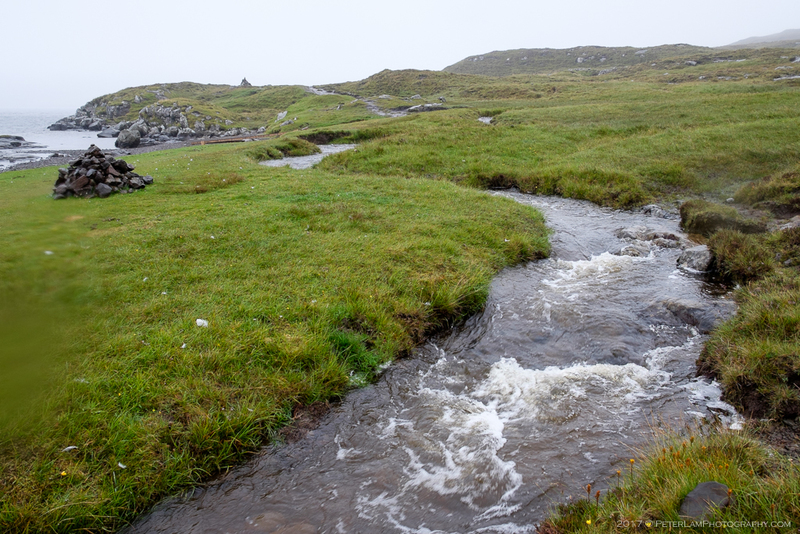 Some streams turned into mini rivers and tricky crossings. Stone shelters near the start of the trail. 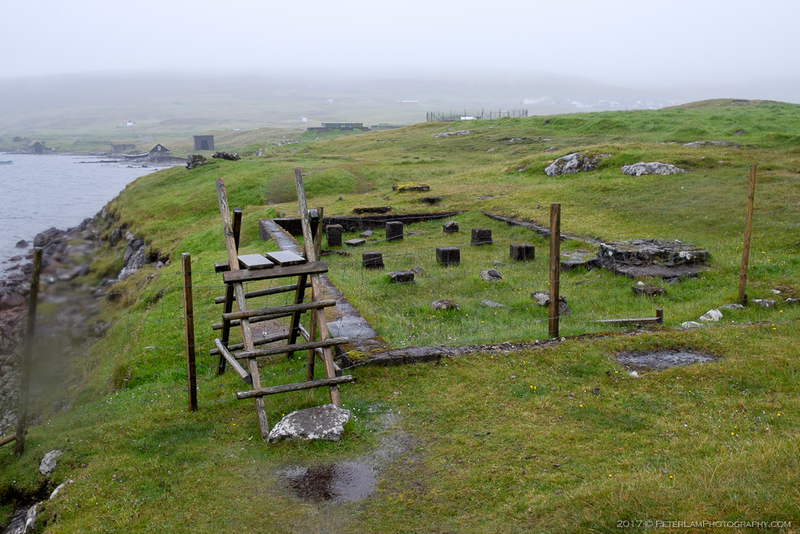 Remnants of a former shelter. Follow the lake and cross the fence to the outfield. At the south side of the lake, steep cliffs and a straight drop into the Atlantic Ocean. Jeff posing at the top. Nothing to see here (and it’s windy, wet, and cold). My apologies! I gave the image credit to http://stamps.fo (which is where it was modified, and downloaded from). 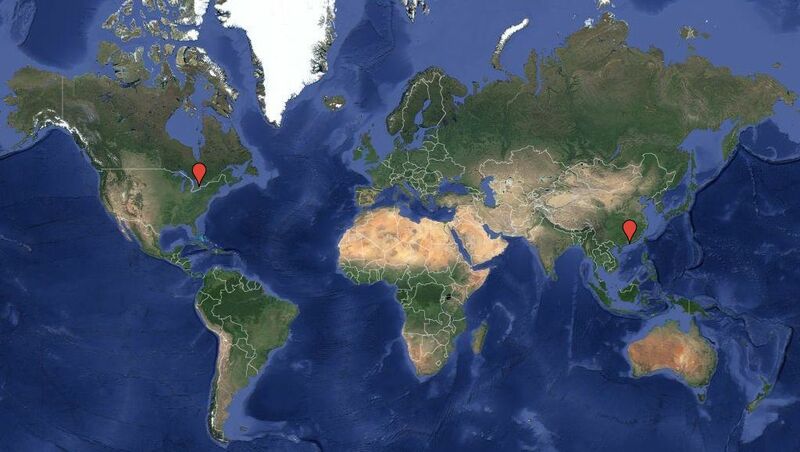 There was no indication of the original owner – I have corrected the link and changed it to redirect to your website.